This baler can be used for a variety of applications. Manufacturing facilities, Recycling plants, Warehouses, and more. This baler can bale almost anything including cardboard, plastics, metals, cans, newsprint and textiles. The convenient conveyor drops the material directly into the baler, making it easy to streamline your baling operations. Other Large Industrial and Commercial Applications. This Super High Volume Baler is so Loaded with Incredible Power & Features, you won't even think about a Horizontal Baler. This Baler is a production workhorse that is built for super high volume output . With a 10" Cylinder, 30 HP Motor and 30 Second Cycle Time, and many other features, this baler will produce big results fast. It is loaded with standard features which includes a conveyor fed automated rear chute. Simply load recyclables in the Conveyor Hopper (which is 48" off the floor for extra safety) and watch this baler work. When the bale needs to be removed, the rear chute automatically closes until the bale is removed. Quickly turn a truckload of loose recyclables into dense, high value bales. 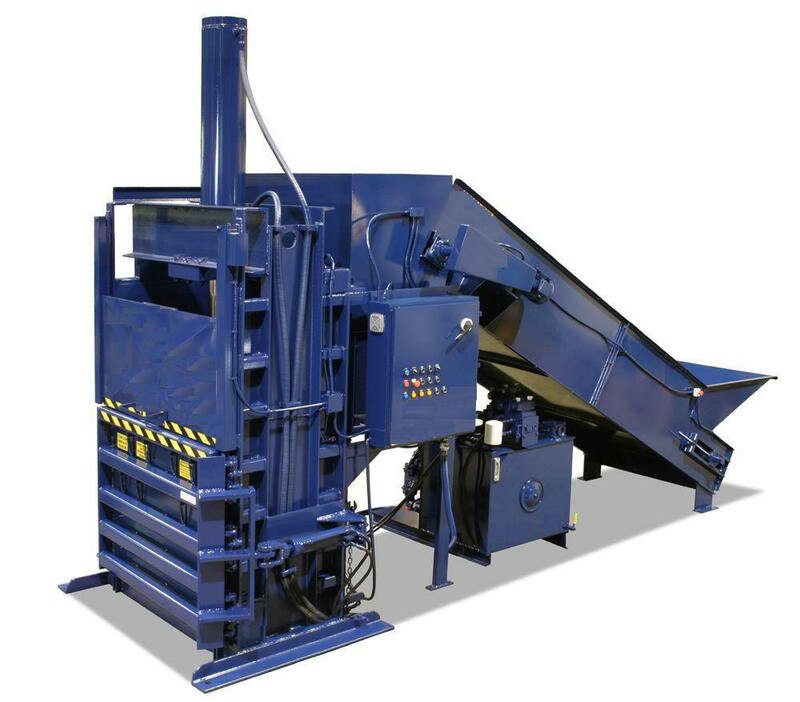 With over 235,000 pounds of platen force it will process a large variety of the toughest recyclables into dense bales. The door is opened and closed by a hydraulic cylinder with a damper controlled feed chute. 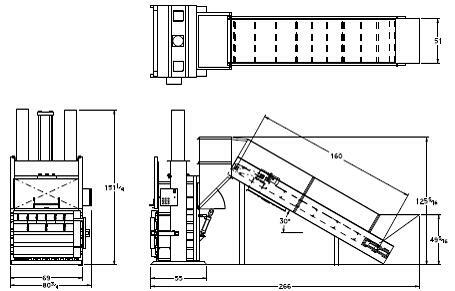 (When coupled with a conveyor, the Automatic Rear Chute is used to feed the baler PET bottles, used beverage containers, aluminum cans and more). With the fast cycle time, you can make 2 to 3 dense cardboard bales weighing approximately 1,500 pounds each in less than an hour. Or you can make can 1 or 2 dense bales of PET weighing approximately 1,000 pounds each. Literally take truckloads of recyclables and turn them into 1or 2 dense bales in less than an hour. Whether it is recycling cardboard, PET bottles, aluminum cans, steel cans, tin cans, newspaper, HDPE (milk jug type containers), magazines or other materials, the design, components and construction is meant to produce many years of trouble-free economical service for our customers. 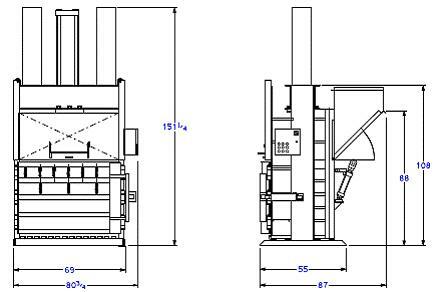 Note: This baler can also be ordered as a stand alone without the Automated Rear Chute or Conveyor which is ideal in a situation where space is at a premium and you need the extremely high capacity of this Baler for bulky materials such as corrugated boxes which can be fed through the front loading door. This Baler (Model 60-2010 only) comes standard with a 20 HP instead of 30 HP.